In spite of the changes coming to the Liliha/Kalihi area, the pace of life is still rather slow, such that watching the daily progress being made on Mexico Restaurante on North School Street, close to Waiakamilo Road, was a source of entertainment to area residents over the holidays. Cost: Dinner for two about $25 to $40 without drinks. As it turns out, the restaurant's "Coming soon!" sign was the best advertising they could have bought. It made neighbors anxious to know just how soon it would open, and always made me hungry for Mexican food, even when I had no appetite at all. The sign was up for so long I had to force myself to stop thinking about it, when suddenly, a co-worker announced, "Hey, I think that Mexican restaurant is open!" For those familiar with Mexican restaurants around the island, this one is owned by the same family behind Mexico Lindo in Kailua. This restaurant is a more ambitious undertaking, with an extensive menu of seafood specialties. Ambition is good within reason. It's generally better to offer only one's best, rather than throw everything into the pot and have the bad diminish the good. Like a lot of restaurants, this one offers more than the staff can handle, with uneven results. While the cooking seems to be a work in progress, a lot of time has been spent on creating the interior's south-of-the-border vibe, with an earthy palette and wooden benches draped with colorful serapes. DEPENDING HOW close it is to payday, you have the option of eating like a pauper or prince, with satisfying results on either end of the scale. On the low end, an order of two soft corn tortilla taqueras with your choice of meat fillings runs $2.50. On the high end, an order of Vallarta or Guadalajara fajitas runs $17.95 and $16.50 respectively. The Vallarta skillet features scallops, shrimp and fish that you roll in flour tortillas at the table. 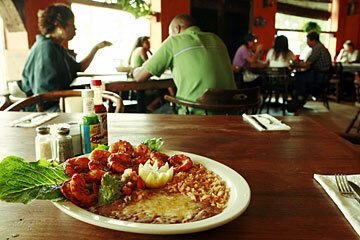 The Guadalajara version features a spectacular platter of chicken, steak and shrimp. I'd go with the latter, particularly because I wasn't impressed with other seafood offerings here. Scallops ($12.95), for instance, seemed to have been cooked rock-solid in advance of taking a dip in chipotle sauce, which is too bad because the sauce itself was excellent. Diablo Shrimp at Mexico Restaurante is jumbo shrimp with roasted garlic, covered with a chipotle hot sauce, served along with beans, rice and guacamole. Similarly, the Mamamia burrito ($13.95) was supposed to be filled with fresh fish and shrimp, in addition to onions, tomatoes and olives. The shrimp was fresh and delicious, but the mahi also seemed to have been cooked stiff in advance of being mixed in with the other ingredients. The saving grace for this burrito is that it's so huge, you could shove the fish to the side and still leave the table full. It was topped by a papaya/avocado salsa, but the papaya was underripe and as tough as a pineapple core. I thought the point of using papaya was to have a counterpoint to any spice added to the dish. I was prepared for such disappointments when we were welcomed with a weak salsa of basic tomato purée with very little seasoning. Thankfully, more effort is made with guacamole mashed with minced onion, cilantro and lime, topped with diced tomatoes. A medium side order is $4.25. EVEN WITH A certain amount of disasters, I've noticed Mexican food here in the islands is essentially critic-proof. One reason is that Mexican restaurants are not as abundant as Chinese and Japanese restaurants, so if there's one in the neighborhood, that's the one people flock to. Over time they simply learn to avoid the culinary land mines. On top of that, the promise of big portions at reasonable prices, few vegetables and recognizable meat is also a draw to people with a childlike aversion to eating anything strange or green. Here, vegetables are represented by a manageable amount of pico de gallo, a tomato relish that garnishes most dishes, and the green of an Anaheim chili is hidden in the deep-fried batter casing of a chili relleño stuffed with cheese ($8.50) or crab meat (two for $15.50). With expectations low by this time, I expected surimi and was pleasantly surprised to find an abundance of real crab meat. Carnitas ($13.25), chili verde ($12.95) and steak asada ($12.25) were tempting, but I opted to try something rarely seen at Mexican restaurants here, basic pork ribs ($15.50). That turned out to be a mistake. Like the fish and beans, these appeared to be twice-cooked to the point that the outer layer was as brittle and palatable as dried twigs. Desserts of fried ice cream ($3.95), churros ($4.25) and flan ($3.95), and breakfast eggs ($9.25) round out the menu.